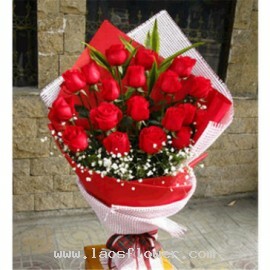 19 roses as the beautiful number and very popular. And it means a beautiful love like "love you forever" - "waiting to meet you" - "nothing can come between us" - "nothing can separate us from each other". By this, try to see it. 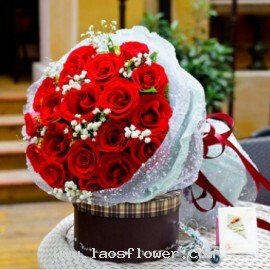 I thought you meant in your mind already ^^ A bouquet of 19 roses are pretty nice. Choose flowers that you like best, or we can arrange a new one. 19 pink roses arrange in a clear glass vase to show on one-sided accent with green leaves and tied with a ribbon. The color of roses can be changed by request when ordering. Occasionally, substitutions may be necessary to create your bouquet due to the availability of certain flowers in various p..
19 pink roses bouquet accent with purple statice flowers at the bottom of the bouquet. Wrapped in purple paper and tied with a white ribbon. You can design your own colors. Occasionally, substitutions may be necessary to create your bouquet due to the availability of certain flowers in various pa..
A bouquet of 19 red roses accent with white gypsophila flowers at the bottom. Wrapped with red paper and white mesh and tied with red ribbon. No. 19 is a lucky number for those who have received this bouquet. Occasionally, substitutions may be necessary to create your bouquet due to the availabil..
A bouquet of 19 red roses accent with white gypsophila flowers. Wrapped in white paper and white lamy on the outer layer. Tie adorned with a crimson ribbon. The color of the flowers and the materials used in this bouquet can be changed, please let us know when ordering or by e-mail. 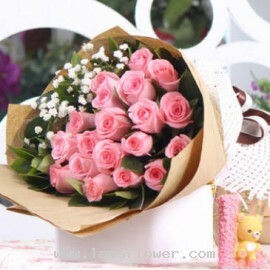 Occasionally,..
A bouquet of 19 pink roses accent with white gypsophila flowers on the side. Bouquet wrapped with pink paper and tied with a pink & white ribbon. The color of flowers, paper and ribbon can be changed as needed. Occasionally, substitutions may be necessary to create your bouquet due to the ava..
A bouquet of 19 yellow roses arrange in the pyramid shape accent with white gypsophila flowers at the bottom of the bouquet. Wrapped in orange paper and tied with yellow ribbon. The color of the flowers and materials used can be changed. Just tell us when ordering. Occasionally, substitutions may..
19 pink roses accent with white gypsophila at the corner of one side. Wrapped in brown paper and then wrapped in a white lamy on the outside. Adorned with white & dark brown bow. 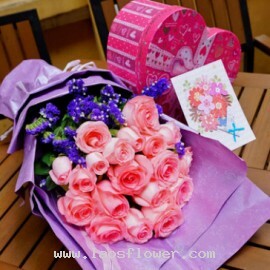 This bouquet is perfect for 19th birthday gift. * The color of roses and paper can be changed as you want. 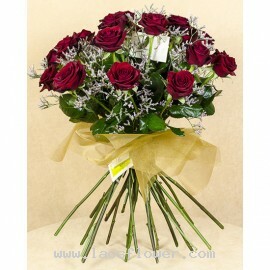 Please let..
A bouquet of 19 red roses arrange in round shape and accent with purple caspia flowers. Wrapped in brown paper. The color of roses and paper can be changed as you wish. Occasionally, substitutions may be necessary to create your bouquet due to the availability of certain flowers in various parts ..